Because of my long time interest in low cost housing, I kept coming across the name of Samuel (Sam/Sambo) Mockbee, associated with Rural Studio, Auburn University, in connection with the housing for poor Black communities in Hale County in Alabama. This was not an association I expected to come out of USA and decided to look into this unexpected phenomenon in more detail. This journey of discovery was exciting but turned sour when I heard of this remarkable man’s death from leukaemia at the age of 57 in 2001. Europe is full of examples where architects, planners, philanthropists made significant contributions to develop social architecture (housing and schools) over last two centuries. Africa and Asia also saw some modest developments during late 20th century but the population, urban growth and poverty have given this problem urgency and much higher profile. However, USA had no history of this ‘liberal–nonsense’, and for a white man to emerge in the heart of one of the most bigoted areas trying to ‘buck the trend’ was noteworthy. This may be the right time to visit this man, his contributions and ambitions at the time when Martin Luther King’s “I have a dream” speech is having its 50th birthday with consensus that dream has hardly come true. Mockbee often quoted Alberti’s call for choosing between fortune and virtue, which he considered a question of value and principle. He thought architects to be by nature leaders and teachers, offering their ’subversive leadership’ for the shaping of environment, breaking up social complacency and challenging the power of status quo. He was repulsed by the thought that architectural profession was coming under the influence of consumer-driven culture and becoming part of the corporate world and corporations. For him architect should not wait to be told which problems need solution, architect should assert his own values that respect and are for the greater good. Mockbee managed to disassociate himself from the bigotry of prevailing racial attitudes of American South and had a look at the effects of poverty and how architects can step over the threshold of injustice and address the true needs of neglected American family and their children who may also come of age without any vision of how to rescue themselves from the curse of poverty. Mockbee once told one of his clients, a Catholic nun named Sister Grace Mary, that he’s not Catholic but “Christian by birth, Buddhist by philosophy, and heathen by nature”. The main purpose of the Rural Studio has been to enable each student, tomorrow’s decision maker, to step across the threshold of misconceived opinions and to design/build with a ‘moral sense’ of service to community, being more concerned with the good effects of architecture then ‘good intentions’. 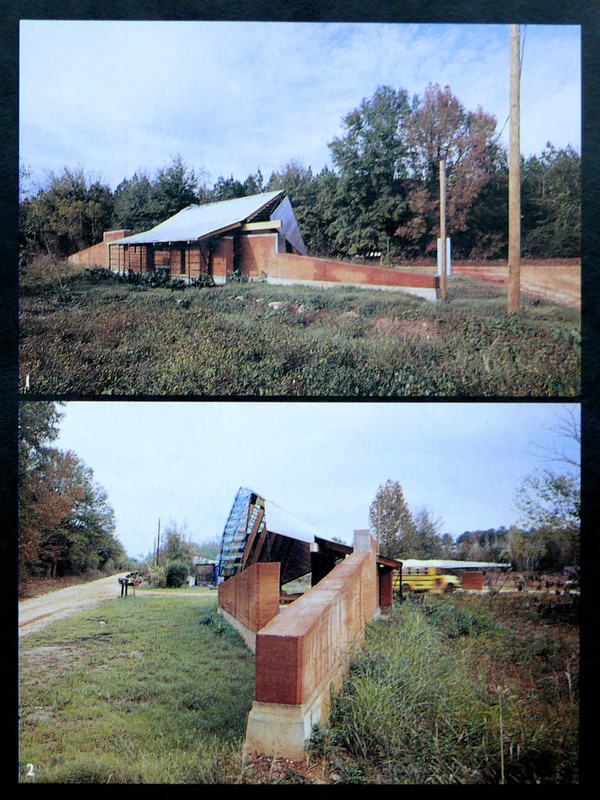 “On a triangular patch of land, next to the dirt road that serves as the hamlet’s arterial, stands a dramatic sculpture of glass and aluminum, cypress and steel and rust-red earth. 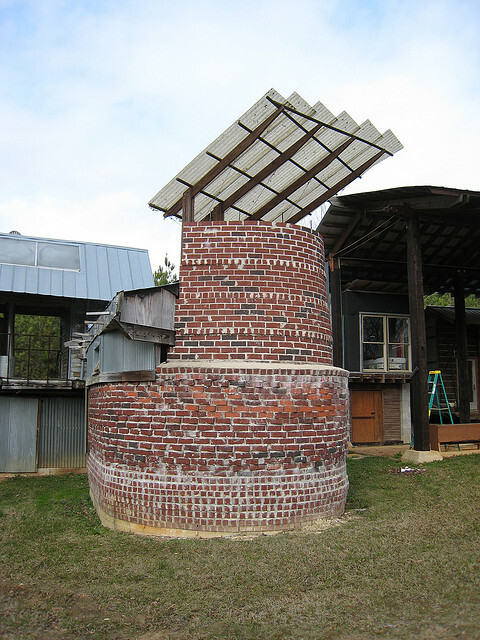 This is the MasonsBendCommunity Center, designed and built as a thesis project by a team of fifth-year students at AuburnUniversity’s Rural Studio. The cost was approximately $20,000. 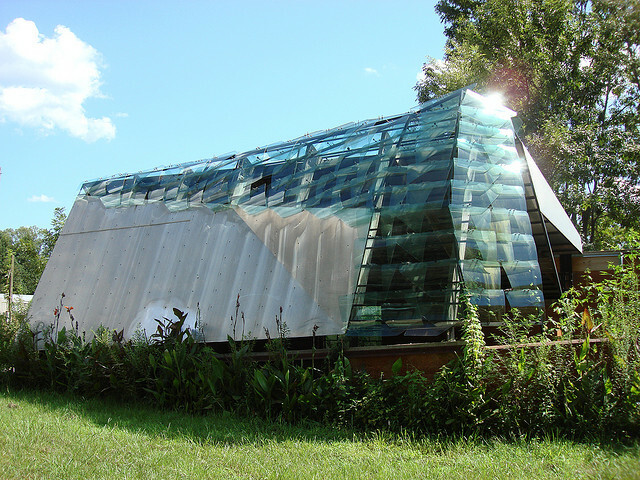 “Mockbee founded what is now called the Rural Studio, ‘Redneck Taliesin South’. Towards the end of his life he used to bring a group of his students to rural HaleCounty to design and build homes for the poor. One of the poorest regions in America, the county has more than 1,400 substandard dwellings, nearly all lacking electricity and running water. According to the 1997 Alabama County Data Book, about one-third of residents there live below the poverty level, with a per capita income just over $12,000 and an unemployment rate of 13 percent. 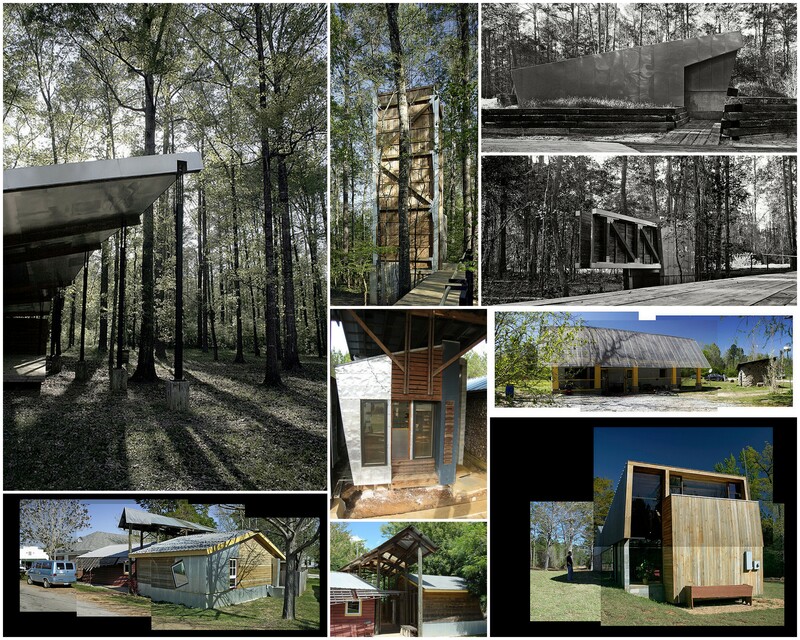 The Rural Studio not only fulfills an overwhelming need for decent housing but gives architecture students the kind of hands-on experience virtually all other educational institutions in the field lack. The houses are built for about $30,000 each using a variety of recycled and discarded materials (tyres, bottles) and funded mostly with grants from a local power company. Designed through a collaborative process involving students and local residents, the homes boast an unconventional modern flair that incorporates the cultural vernacular of the region. Lucy’s house made of 72,000 carpet tiles is now well known all over architectural community. They may be cheap, but these are nice houses.” Mockbee thought that these should be good enough for him to live in with his family. That Rural Studio is not only self-regulating, but it produces buildings of exceptional quality in direct response to the needs of the community, suggests that it has evolved from a teaching exercise to an alternative and compelling practical asset. The New York Times published a feature on Rural Studio in December 2005 resulting in crowds of ‘camera/map carrying’ tourists seeking location of Mason’s Bend. With this kind of background the appearances start to matter, the church which was lacking frequent cleaning and was underused by the community became an embarrassment. This brought a changing attitude towards future community buildings and their future upkeep by apportioning responsibilities to various community members from start. Freear wondered if Rural Studio has now reached its limit as a domestic housing endeavour, a well-intentioned educational experience benefiting a needy few, or could it evolve into a more serious and wide-ranging social project? Projects are no longer conceived as isolated objects but links in a chain of essential social service. The most recently completed final year projects exemplify this approach. 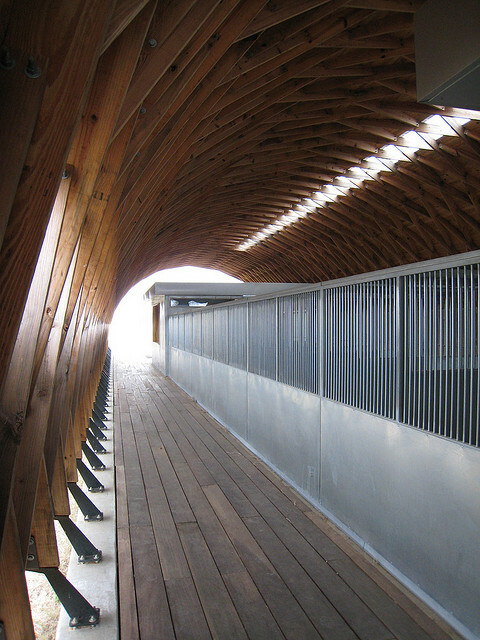 Comprising a cell like lamella animal shelter, public park and hospital courtyard, rejuvenated as an attractive courtyard with expanded metal trellis serving staff. Freear feels that he is also nearing his own limitations as a Director and recently started to take some classes at AA with an Indian architect Anapama Kundoo. On a personal level looking back at the contributions Mockbee made fills you with admiration but its significance and impact on the root cause of poverty, resulting deprivation and alleviating it remains a mere ‘pin-prick’. Suffice to say that few hundred houses and community buildings for a deprived community means a lot. However, the hope for me lies in the generations of young architects coming out of this ‘educational exposure’ with some idea of what ‘needs/survival’ really means to people they hardly knew existed. I can only hope that even if some of them carry a small fraction of some of Mockbee’s generosity and wisdom the dream Mockbee had may be partly realized. The information for this blog has been abstracted from Mockbee’s writings, interview and various magazine articles listed briefly below. The photographs are mostly attributed to my Flickr friends Ken Mccown and David Brown (odb). Their Flickr sites are well worth a visit. Intereiew by Brian Libby April 2001; ‘Architecture without pretense’ by Christian Kreyling; ‘Community Hero’ by Jennifer Beck; Article by Andrea Oppenheimer Dean in Architectural Record. 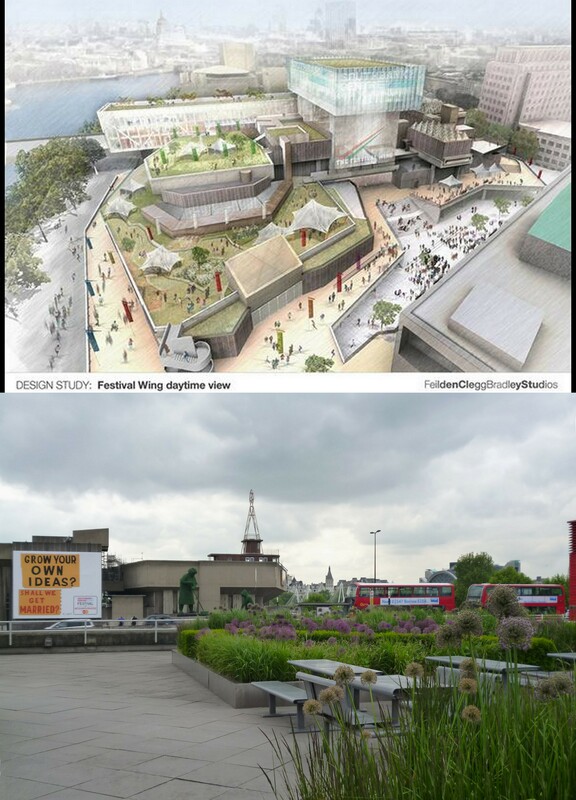 South Bank Redevelopment Proposals by Fielden Clegg Bradley Studios. 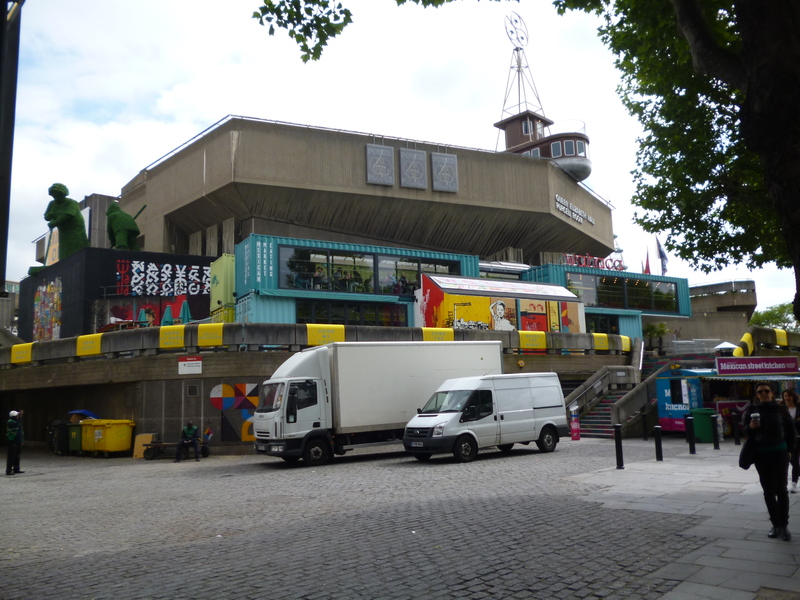 You may have gathered from my recent contributions on Flickr that I have virtually grown with the South Bank and have been a frequent user of all the venues in this area from early 60s to now. I have also admired Fielden Clegg Bradley Studios work for some time. With this background, I would like to express some of my initial views concerning the proposals which are based on fairly sketchy information released to the press. I was of the view that this complex should not be listed, however appointment of an intelligent architectural practice and a sensible brief was essential to do justice to the site and it was a relief to see FCB appointed. It is obvious that the client is desperate to cram maximum accommodation on this site to meet their expectations after leading a frustrated existence without having many ‘bells and whistles’ similar recently built projects have in major cities. Architects seem to be performing a difficult ‘tight-rope’ trick and their initial offerings seem quite an outstanding achievement. This is not a bad time to raise concerns by observers who know this area and its history of growth and have some constructive criticism to offer. 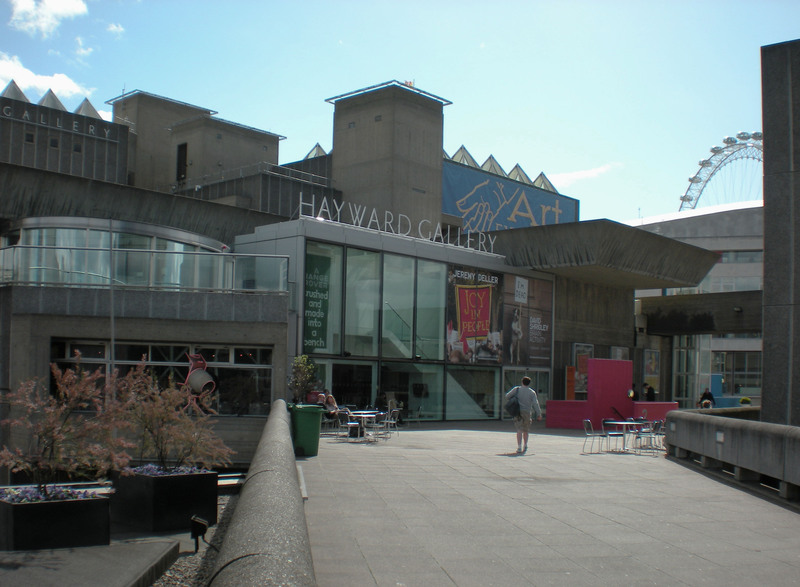 The architectural pedigrees of the original 60s buildings and RFH are well known and ‘over-reverential’ architectural approach to alterations sometime expected by conservationists would be inappropriate in this instance. The proposals for central raised block facing RFH may appear large but I see this as a good location to gain badly needed accommodation. 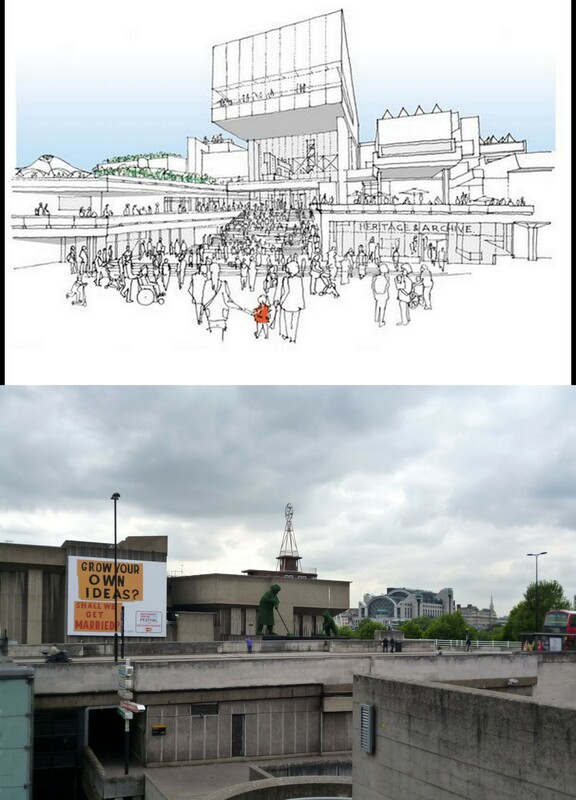 My only observation (not a criticism) is that the existing pedestrian route under Waterloo Bridge connecting this main space to the terraces of National Theatre is extremely restricted and arrival at the side of NT from under the bridge is a disappointing experience and is a bit of an anti climax. Some improvements around here, with blessings of NT, would be hugely beneficial to all concerned. My main concerns relate to the long glass block running parallel to the bridge housing Poetry Library, Literature Centre and Restaurants. 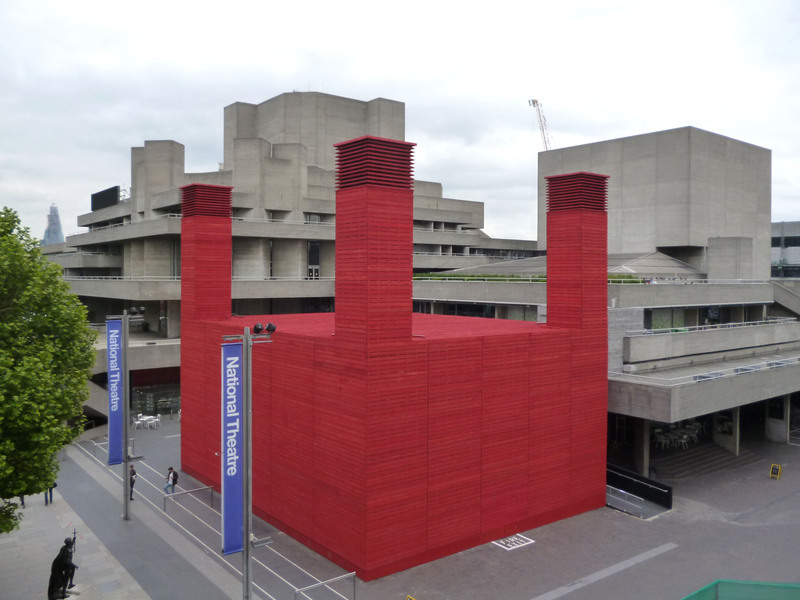 The building works and fits well when seen from Hungerford Bridge side as it acts as another ‘book-end’ (the other one being the new building between RFH and railway track) and neatly contains the activities on this side of the Waterloo Bridge. However, in my opinion all the negative factors come into play from Waterloo Bridge and NT side. Let me share some of these negative aspects and its impact on the surrounding area. The pedestrians and drivers when crossing the bridge are able to see concrete structures of NT on one and QEH, Hayward on the other side with their distinct ‘idiosyncratic approaches’ almost having a dialogue with each other. This would be interrupted by the new block at least at QEH end. The end elevation of this block as seen by people on the bridge approaching Waterloo Station would be out of character and far from satisfactory in its scale and appearance. Although the views from inside this building can be very exciting. 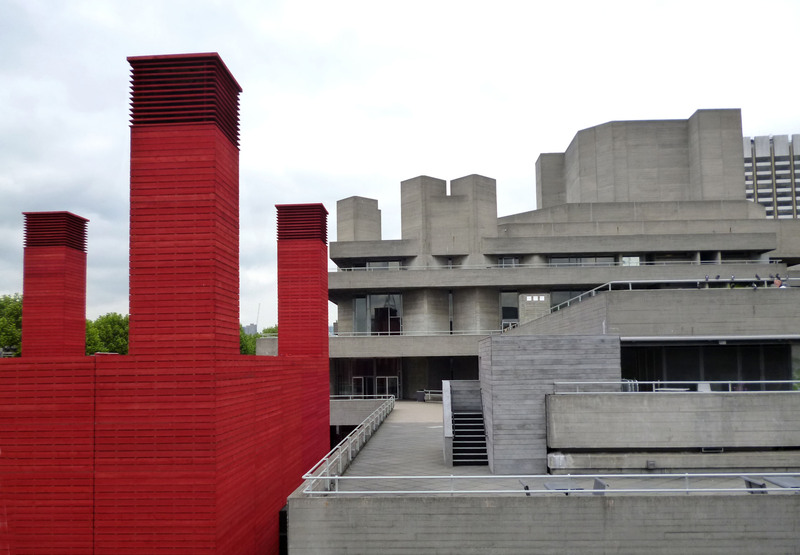 The views from the roof terraces of National Theatre currently enjoying the side elevations of QEH would be lost for ever depriving the witty bouncing of a concrete banter between these dissimilar but contemporary icons. Walking at the bottom of a fairly long sheer wall of this block close to the Bridge pavement is alien in to the local urban context. A similar situation is only experienced where the pavement abuts the building line in Lancaster Place which directly relates to context of Strand and well before the bridge starts. Once you are on the bridge the ability to look down from pavements on both sides exists throughout the length of the bridge which will be disrupted by this block. An important architectural location without listed status puts even more onerous responsibility on a caring and gifted architect and the client. This is a good scheme to prove that excellent results are possible to obtain without ‘crutches’ of listing status. 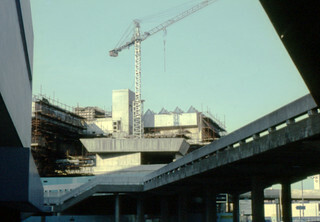 The end of the linear block would rise on the left of QEH. Lower floor is probably Cafe or Restaurant. 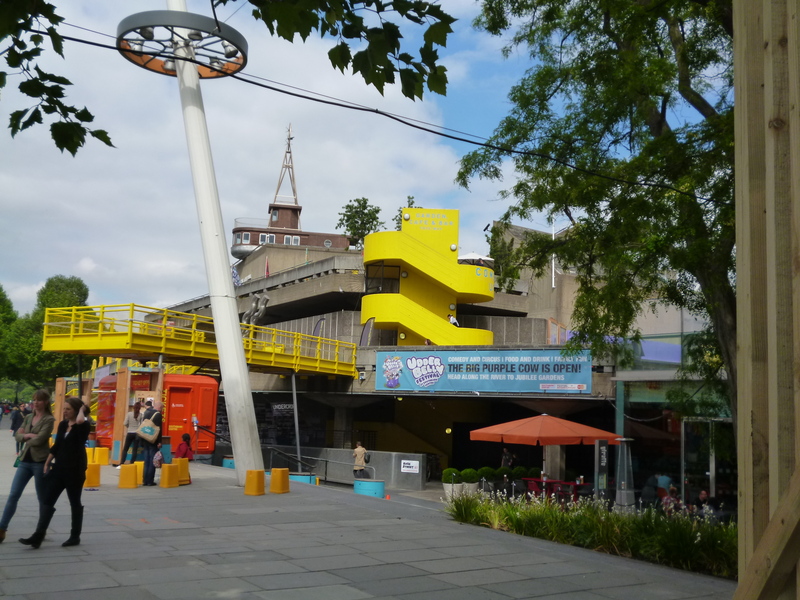 The views from the footpaths of Waterloo Bridge give you glimpses of a busy riverside walk and various terraces of NT. All sketches and perspectives from Architects press release and photos by Iqbal Aalam. Crematorium, Crownhill, Milton Keynes. An homage to Louis Kahn. The high quality of architectural and planning output during inception, birth and infancy of Milton Keynes was not accidental. 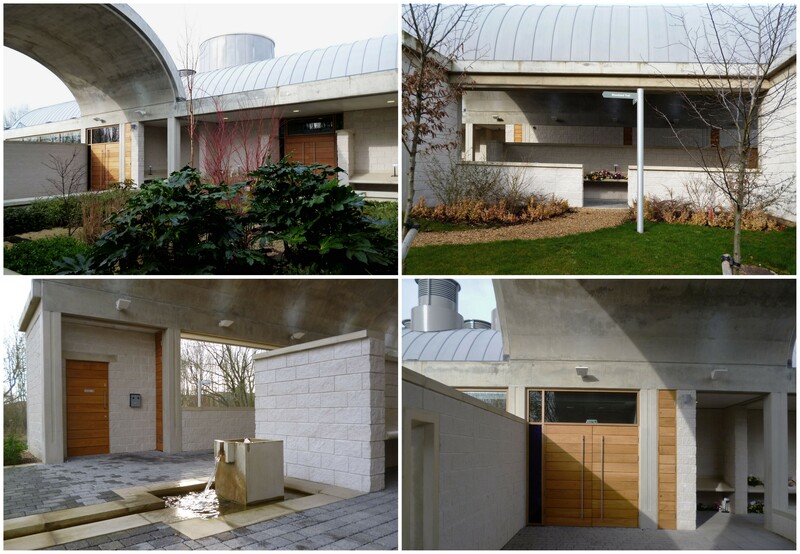 Derek Walker led a gifted team of professionals working with him in MK Development Corporation and commissioned good architects of international and national repute to build housing, civic and other building types within the city. The demise of MKDC in 1992 and subsequent political changes started to dismantle the architectural department within the Council which was supposed to take over and supervise the responsibility of completing the growth of the city. The financial constraints and changes in house building/selling sector started a race to build to obtain biggest profits and financial savings without much regard for sensible commissioning in order to obtain the best possible architectural quality to fulfil the original goals of design and planning. The decline in architectural standards is so overwhelming that the earlier levels of ‘acceptable/mediocre’ can now easily pass as ‘excellent’ and if anything of some merit is built, it is welcomed with disbelief and needs celebrating. 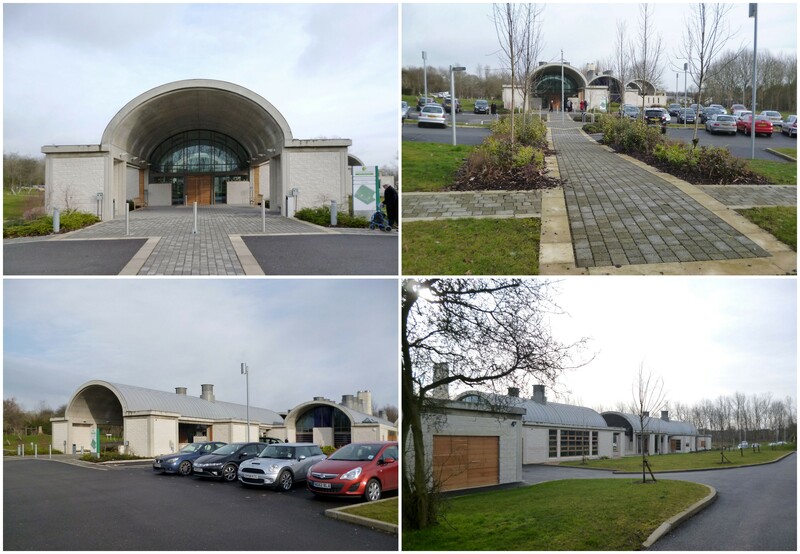 The building of Crownhill Crematorium is such an example where a series of happy coincidences led to ‘birth’ of a building dealing with the emotional issues of ‘death’. The so called birth took place in the back seat of a taxi (assisted by the father) as it was rushing to reach hospital. Adrian Morrow, the young project designer with an impressive list of buildings to show against his name and a long list of first class architectural practices he has worked for, happened to be working in Architects Department during its death throes when this project arrived on his desk. 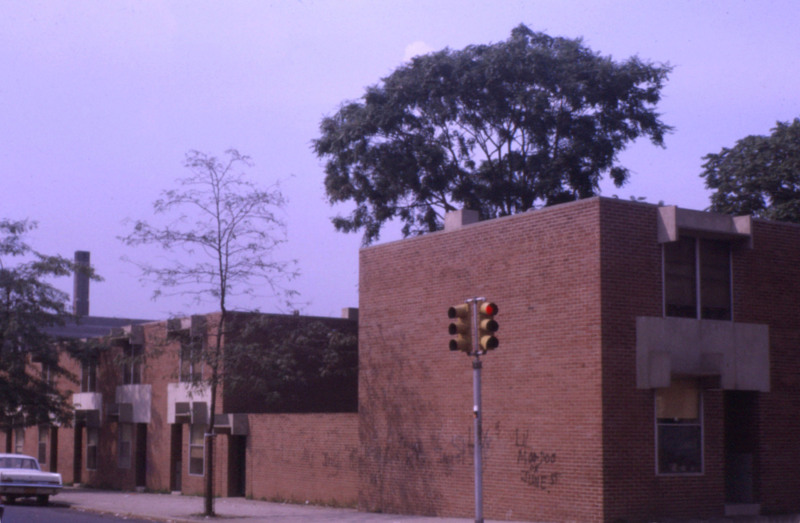 The rapid population growth of the city meant that the existing crematorium built in 1982 by Roger Hobbs was unable to cope with the increased demands. 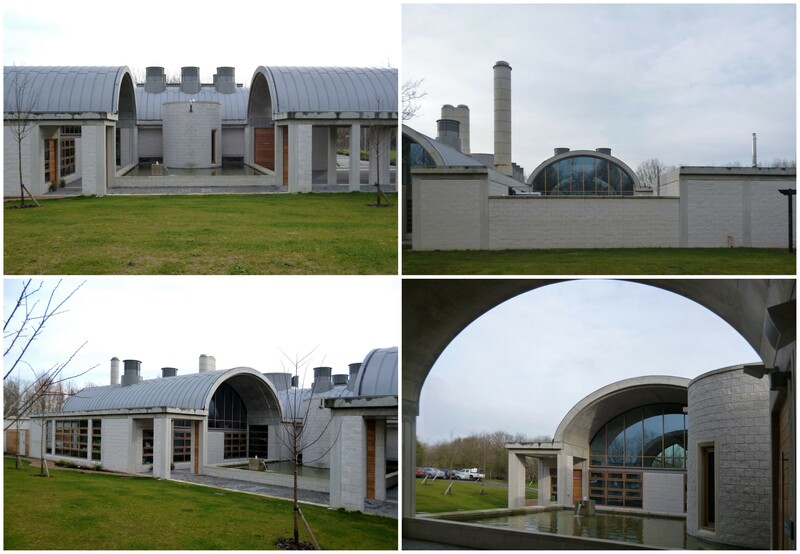 Adrian Morrow’s commitment to good architecture must have speeded his efforts to complete work on Crematorium detailed design, fighting against uncertainty of existence as Council’s architect. The new energy regulations and sustainability issues were dealt with and working drawing stage completed speedily before the inevitable ‘Project Managers’ took over the job and Council’s Architecture Department’s ‘life support’ was withdrawn and unwittingly the department became the first candidate for cremation in the new building (metaphorically speaking of course, just like Asplund’s in Woodland Cemetery). The opportunity of seeing a worthwhile building in Milton Keynes after a while is too good to miss. It may not be able to withstand a direct comparison with Asplund-Lewerentz’s Woodland Cemetery in its scale, masterly handling of landscape and classicism of Swedish vernacular but there were lessons to be learnt. The comparison with the other famous example of Funerary buildings, Scarpa’s Brion Family Cemetery (1968-78) would be grossly unfair at various levels but relevant when considering the experience of family and friends during emotionally traumatic occasions when the intimate internal and external spaces are able to offer solace and contemplation to affected users. However, since the architect fairly and openly acknowledges Louis Kahn’s Kimbell Art Museum as the main inspiration for this building, a few related things are worth discussing. 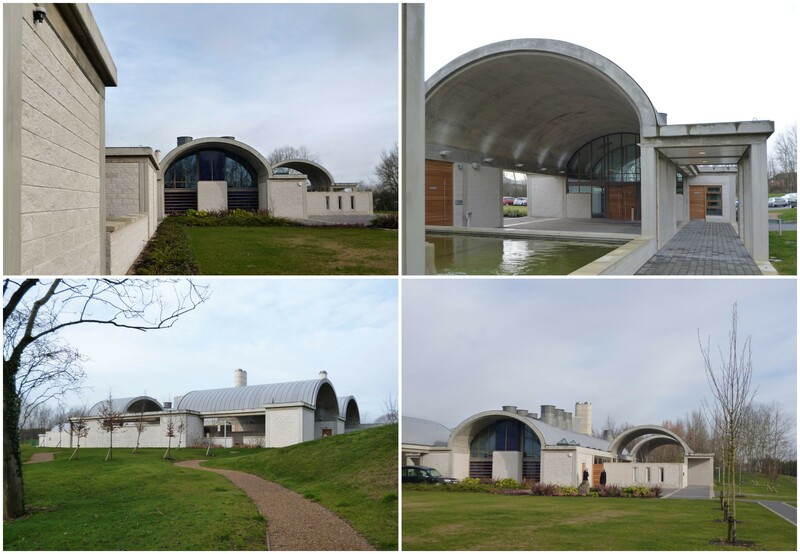 Like most architects of his age, Adrian Morrow knows and understands Kahn’s work, (as Charles Correa’s use of Kahn’s Trenton Bath House at Gandhi Ashram in India) chose to use Kimbell’s vocabulary of concrete vaults with flat roofs to create ‘servant and served’ spaces. A good model to follow, as judicial spacing of vaulted roofs proved flexible to cope with varying and sensitive space requirements of the brief for internal and external spaces. 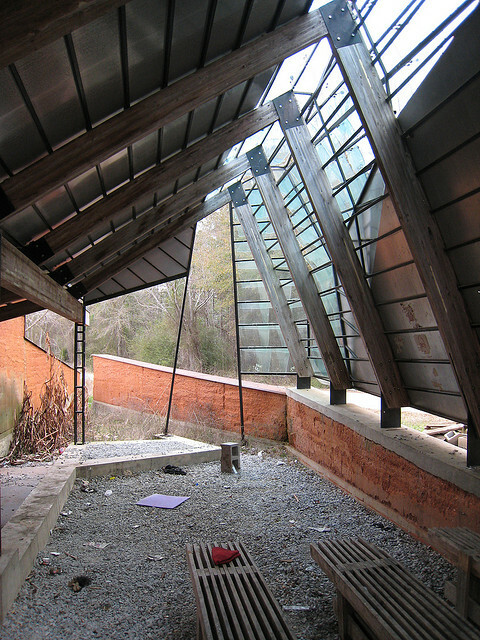 The roof was originally designed before the sustainability requirements imposed rows of wind catchers. These clusters distract the eye from the simplicity of extruded vaults used by Kahn, but since the intentions are noble and a touch of ‘science fiction’ adds an extra layer of experience, I find it more than acceptable. My main disappointment lies with the way the car park sits in front of the building dominating the approach and exit for the mourners. The act of approaching the imposing entrance vault through cars looks abrupt and cluttered. Similarly the car park dominates the view as you leave the chapel using the side exit via an intimate well designed landscaped courtyard, created by parting of two vaulted roofs. 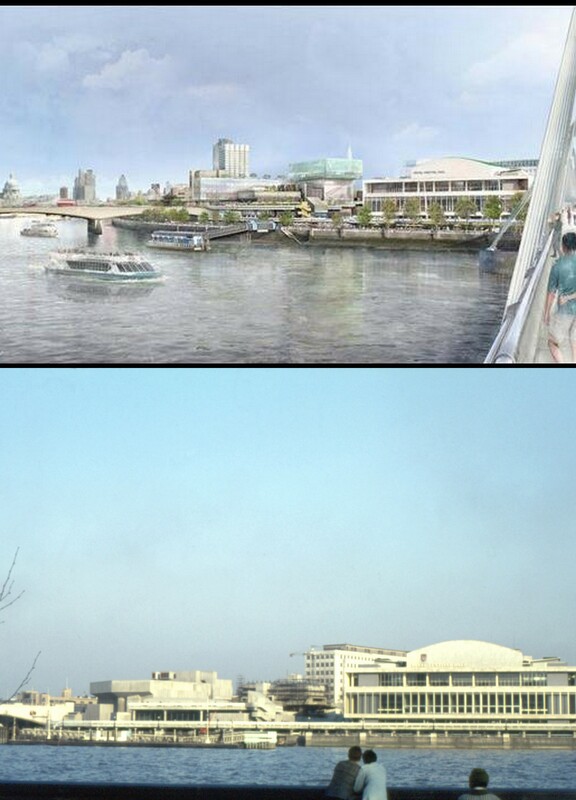 The marrying of cars building and landscaped/water side walk is unresolved and to a degree lets the project down. 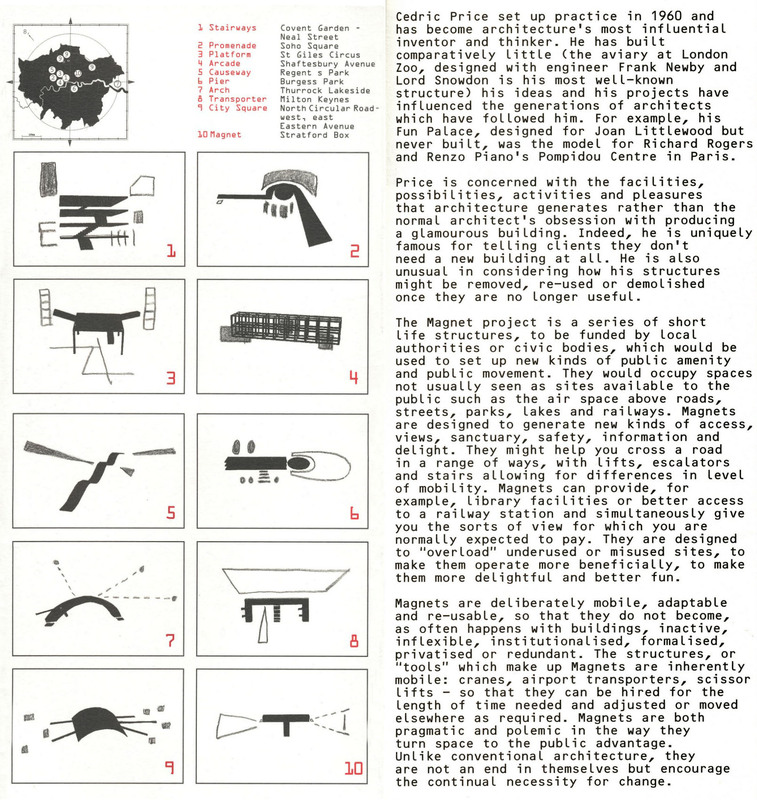 Short description of 3 winning entries (Atelier 5, Kikutake-Kurokawa-Maki and Herbert Ohl), and one entry (Christopher Alexander) supported by a split jury. 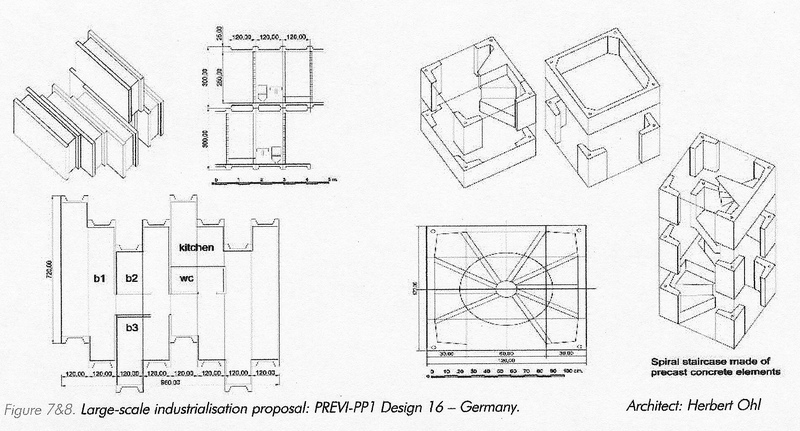 Having covered the background of PREVI, a glimpse of the competition Brief and the resulting buildings, with particular reference to James Stirling’s proposals, were explored in my first Blog, now I would like to go through the original winning entries and their progress over last 40 years. 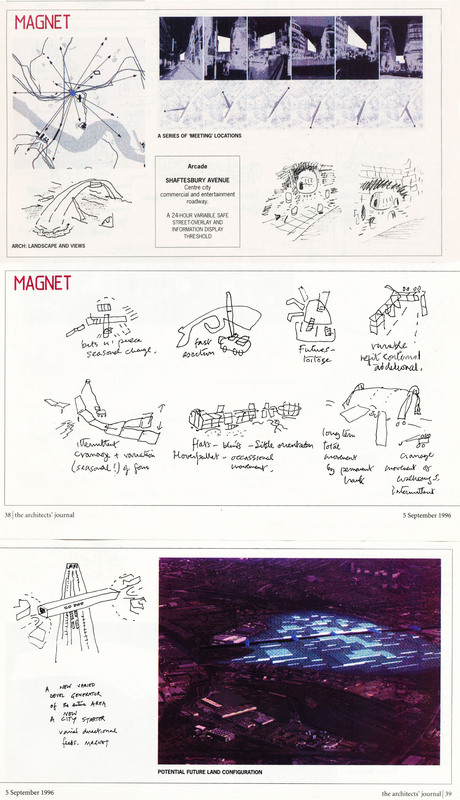 You would recall that the jury chose 3 winning projects from 13 International architects in 1969. Atelier5; Kikutake-Kurokawa-Maki; and Herbert Ohl were the official winners but there was a split in the jury and Centre for Environmental Structure by Christopher Alexander was considered by this jury to be worthy of a winner. Jury thought that Atelier 5 scheme used an interesting method (possibly economical) of construction using pre-cast concrete panels small enough to be built on site and manhandled for wall and roof construction. They considered that two storey house plan appeared complex with patios and internal spaces. The external communal spaces and separation of traffic was well liked. In a recent interview Alfredo Pini of Atelier 5 said that their invitation to PREVI was a result of their successful Halen project. They were full of praise for the aims, objectives and the process of the competition. The implementation of their 25 units took place in accordance with their plans but the distance and complexities made the involvement difficult towards the end. They were pleasantly surprised to see the attention and care given to external public spaces after decades of use. Kikutake, Maki and Kurokawa and Associates also used pre-cast concrete system with different loadings which also included foundations, again considered well worked out and likely to save costs. House plan grouped service areas with potential of local industry producing equipment/units for Kitchen, Toilets and storage in future. The external spaces in this scheme also separated cars from pedestrians but some jury members considered the spaces were possibly too extensive for effective use. Fumihiko Maki in a recent interview recalls the original brief. 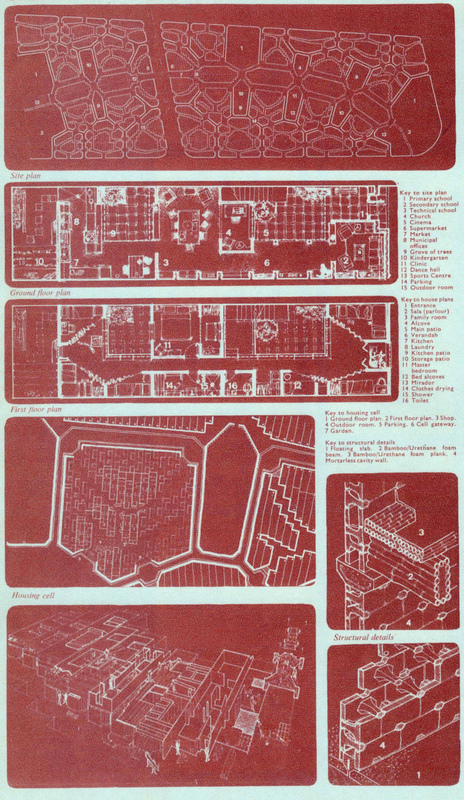 The large growing families would reflect the growth of houses, an important metabolist concept. He welcomed the changes to the houses but was concerned about the extra floors being built on modest original foundations in an earthquake zone. Herbert Ohl scheme was problematic from start. Design was sophisticated use of extensive large pre-cast elements using complex arrangement resulting in a shell which could accommodate internal changes with ease and flexibility. 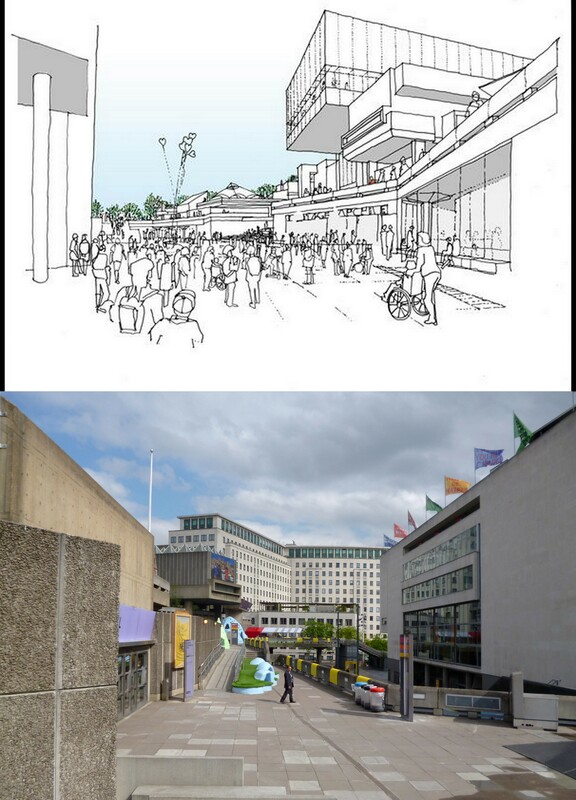 There was proposal for an underground ‘service spine and car parking’. Minority jury disliked Ohl’s scheme and considered it regimented, inhuman and expensive. The ‘travelling crane’ in their view became a designer rather than a useful tool. 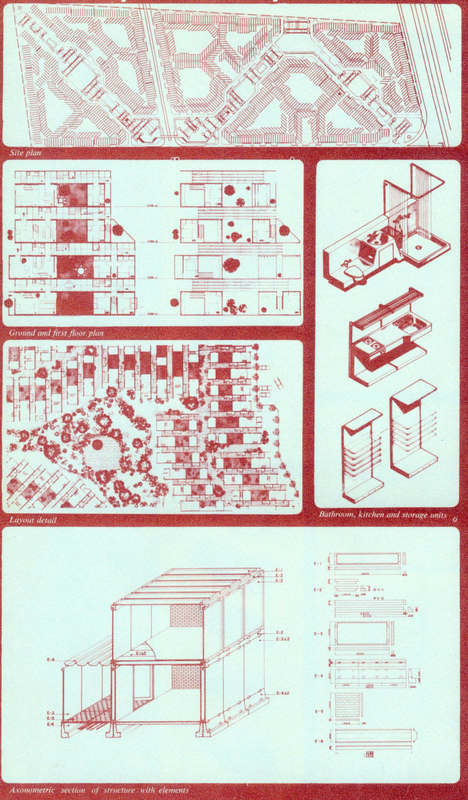 Architect anticipated a democratic interchange between human and technological factors, stimulating multiplicity, flexibility, micro and macro relations; … all using dimensional and functional modules. The mobile crane was able to provide universal frame structure at any time without disturbing the community. As feared, the complexity and difficulty of producing even a small part of this scheme failed to be built in the ‘sample’ project constructed under Peter Land’s supervision. The science fiction approach may have been exciting to explore but was very unrealistic and removed from the objectives of the competition. I am surprised it was one of the 3 schemes chosen as winners. Interview by Martanne Baumgartner and Tomeu Ramis, ETH Zurich. The building system uses fewest standard components to provide maximum variety and choice of solutions… the proposed use of bamboo, urethane, and sulphur structural members may not be new or proven but was in keeping with the spirit of this competition. 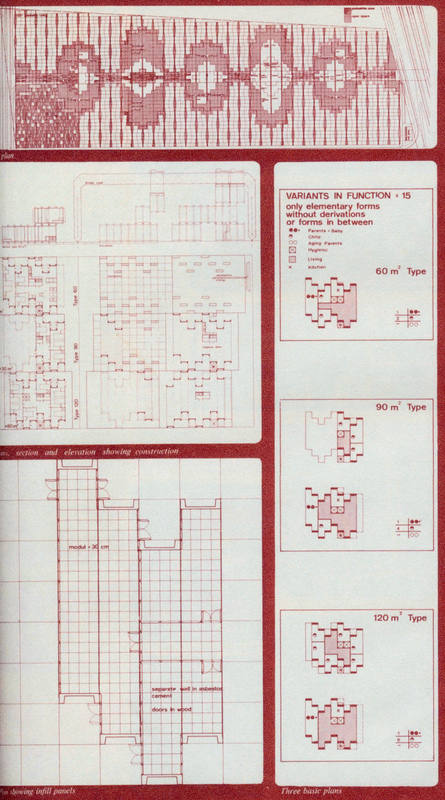 It is difficult to explain the concepts behind the ‘cell structure’ of the housing layout in this short introduction but it is a fascinating report to study if you can lay your hands on it. The house layout considers various traditional aspects of Peruvians social/living habits. The house construction was aimed at using local materials and traditions where possible. The foundations were floating slabs supporting load-bearing walls and a lightweight plank and beam floor/roof. An ingenious interlocking mortar-less concrete-block for wall construction, reinforced with sulphur, with cavity for plumbing and conduits. The planks and beams are made of urethane foam-plastic and bamboo, reinforced with sulphur-sand topping; all are earthquake resistant methods of construction. 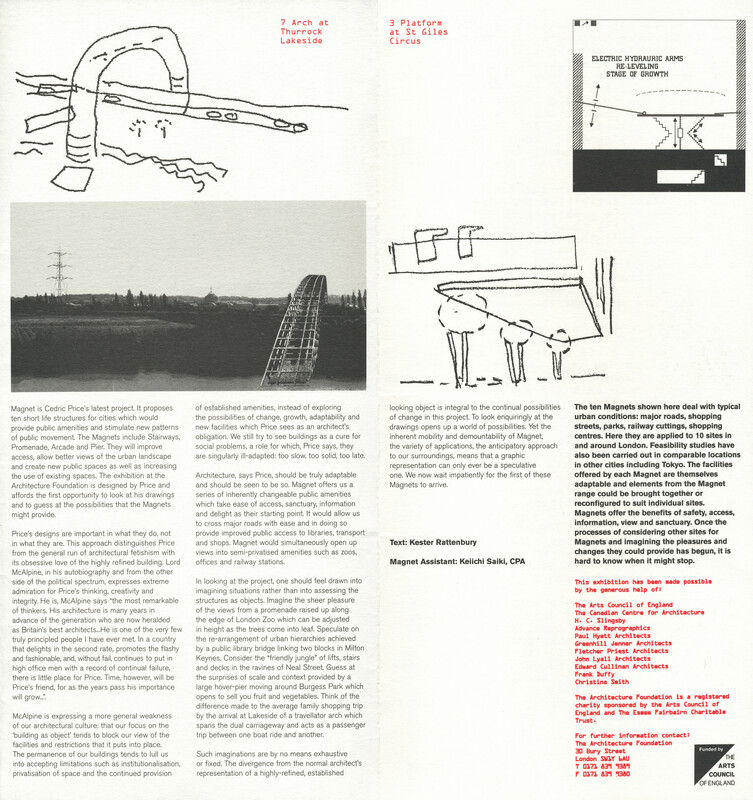 AD 4/70, Competition drawings and Thick Walls AD Feb 1968; Domus, April 2011,’ Metabolist utopia’; ‘The validity of PREVI, Lima, Peru, 40 years on’ by Julian Salas and Patricia Lucas. 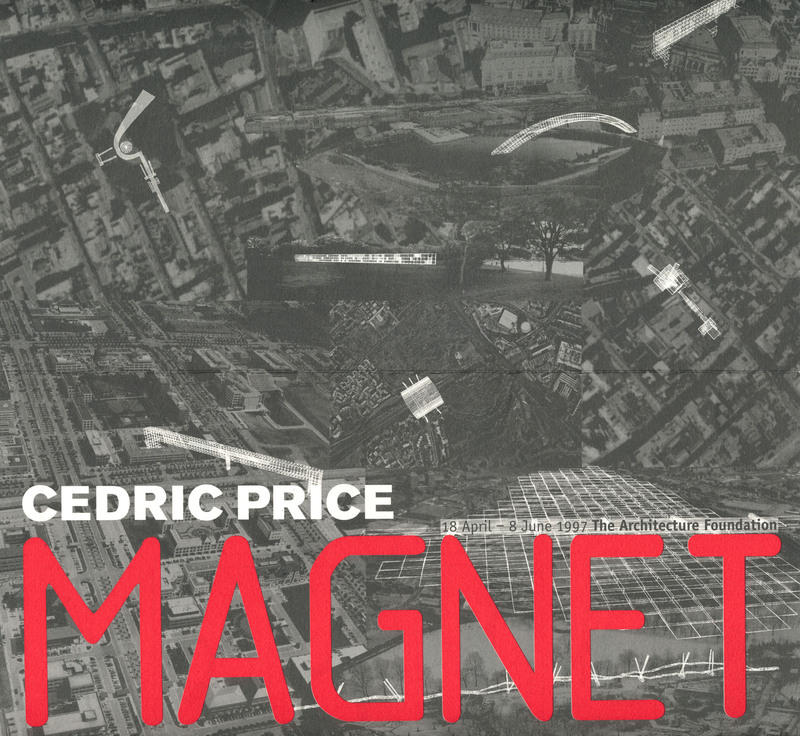 Cedric Price, Anticipating the unexpected, Magnets. 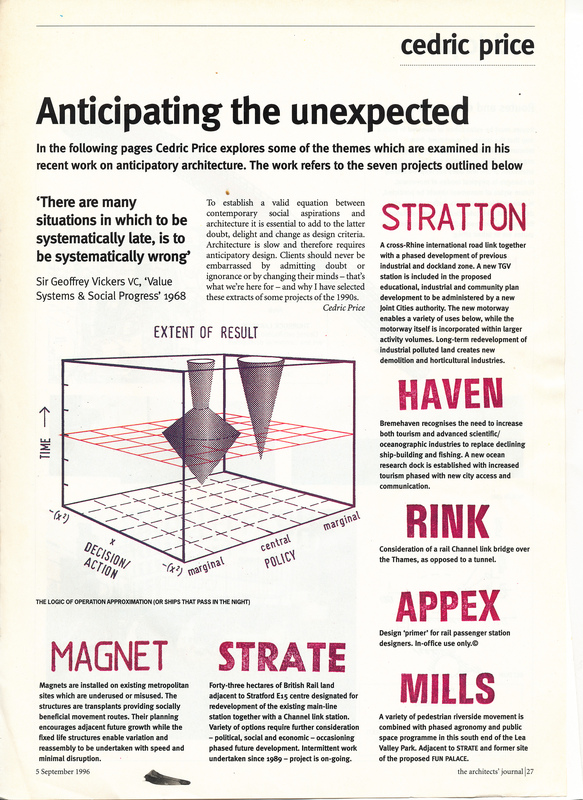 Towards the end of 1996 Cedric Price explored seven projects on the theme of anticipatory architecture, which were published in Architects’ Journal of 5th September 1996. 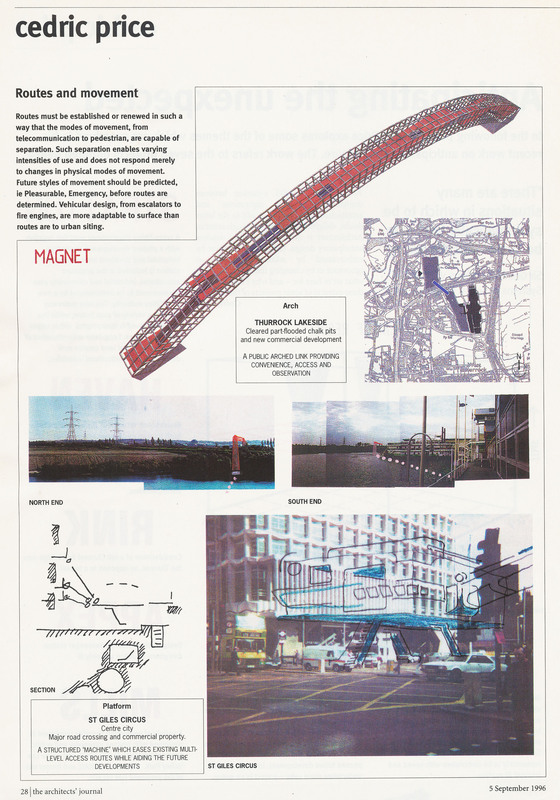 This publication was followed by an exhibition called ‘Magnet’, arranged by The Architecture Foundation held in London from 18th April to 8th June 1997. 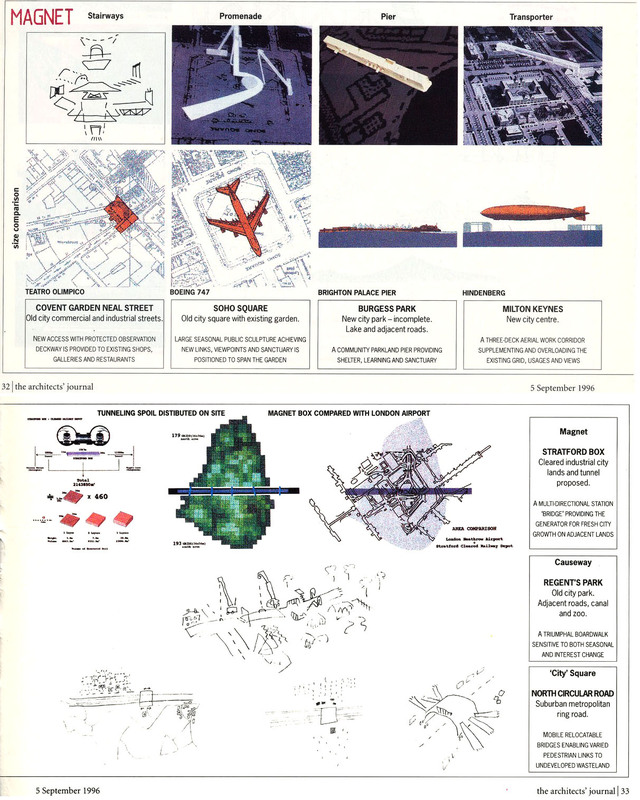 There is hardly any point in writing anything as an explanation or summary for Cedric Price, a difficult enough task for expert architectural writers, but in my inadequate hands it will be nothing short of a disaster. My thank to AJ and Kester Rattenbury for borrowing the abstracts from their writings. Louis Kahn, Lesser known early work. 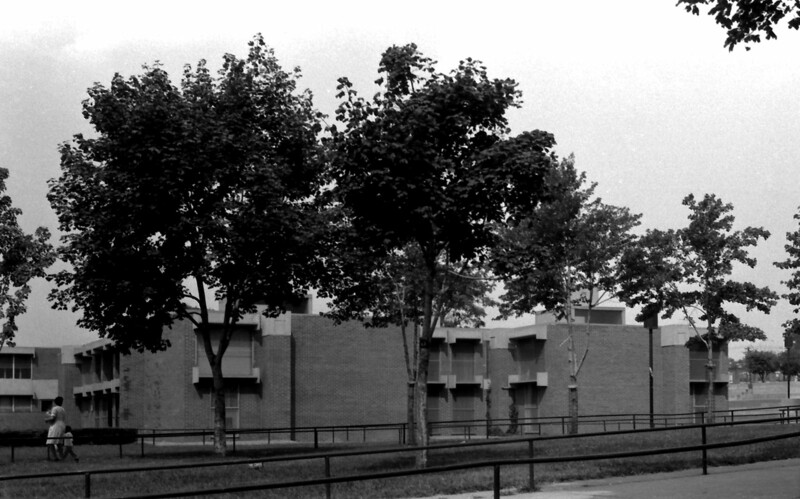 Louis Kahn’s work before Yale University Art Gallery (1950) is not very well known and publicised. However it is worth remembering that he was practicing since early 30s. 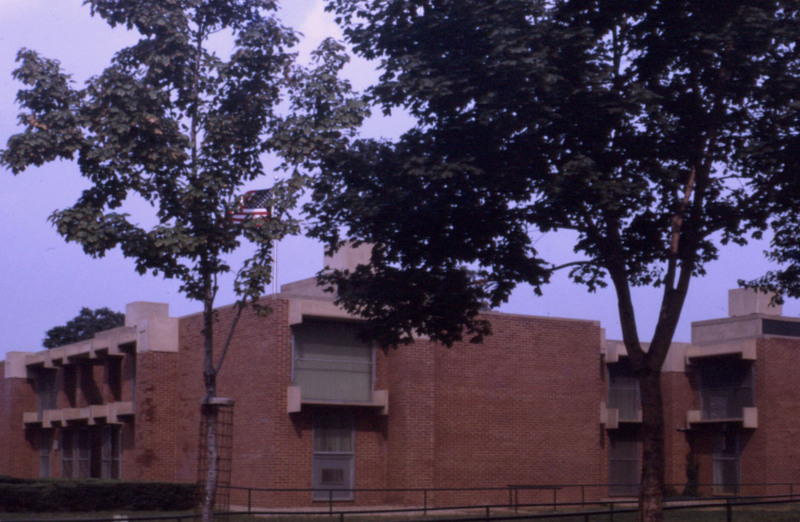 Louis Kahn served as a consultant to the Philadelphia Housing Authority and the United States Housing Authority in 1930s. He had a deep sense of social responsibility and was very interested in providing low cost housing. He also worked with European émigrés Alfred Kastner and Oskar Stonorov. housing projects such as Carver Court in Coatesville (composite; top left), Pennsylvania (1941-1944) and Pennypack Woods in Philadelphia (1941-1943). 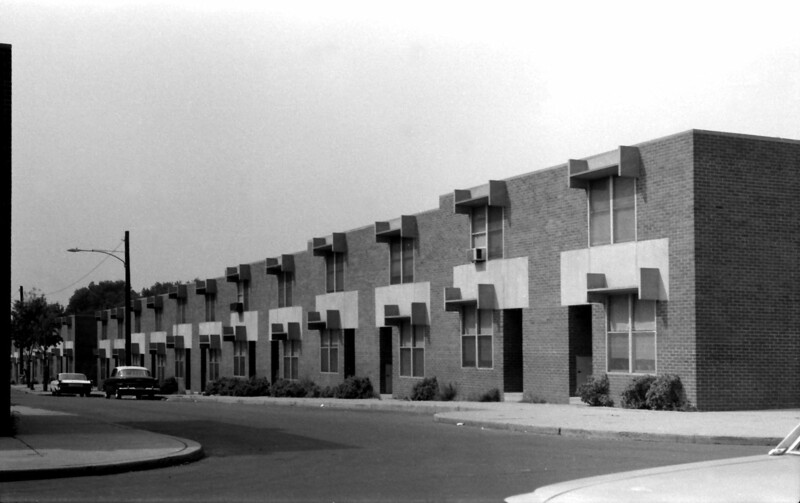 His last scheme of this period was the public housing in Philadelphia’s Mill Creek Housing project (1951-1963). In late 40s Louis Kahn‘s career took-off when he established an independent practice and began to teach at Yale University and then at the University of Pennsylvania as Professor of Architecture (1957-1974). During those years, his ideas about architecture and the city took shape and early work of idealism that followed the international modernism was re-examined and reassessed by him and we all know the impact that produced on architectural history for the rest of 20th century. I visited Canada and USA as a student in 1967 and attempted to see as much of his work as I could. On my visit to Mill Creek Housing I could not help noticing boarded up properties and a general feeling of deterioration. Few years ago when I learnt that the Estate was demolished, I was surprised and rather puzzled but put it down to possible social deprivation, poor maintenance and ‘sink status’ – a situation one comes across in Britain social housing frequently. A quick search on internet started to unfold a different story which may be worth noting. Apparently the apartments were built on top of the Mill Creek flood plains. In 1961 several blocks of houses collapsed causing some deaths and as a result 111 houses were condemned and demolished. 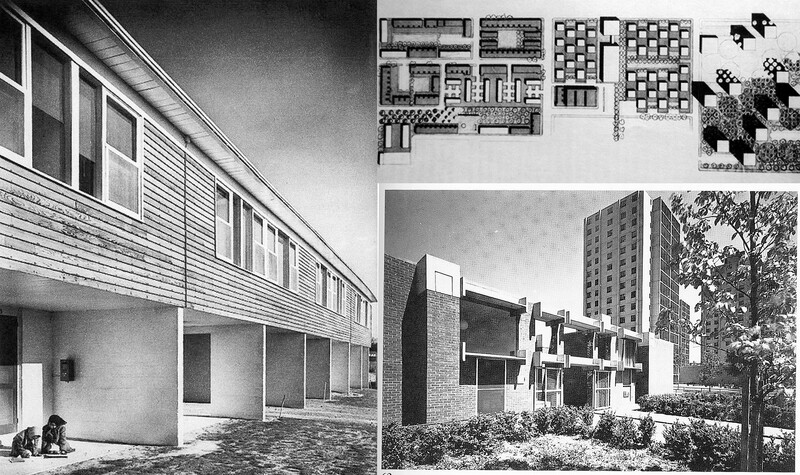 There were also three 17 storey tall residential blocks, also designed by Kahn in a subsequent phase see composite top right-bottom), which I am informed were a social disaster as far as accommodation was concerned were also demolished. In the photo on top, Carver Court B&W photo attributed to Wiki Arquitectura. Site layout from http://www.design.upenn.edu. 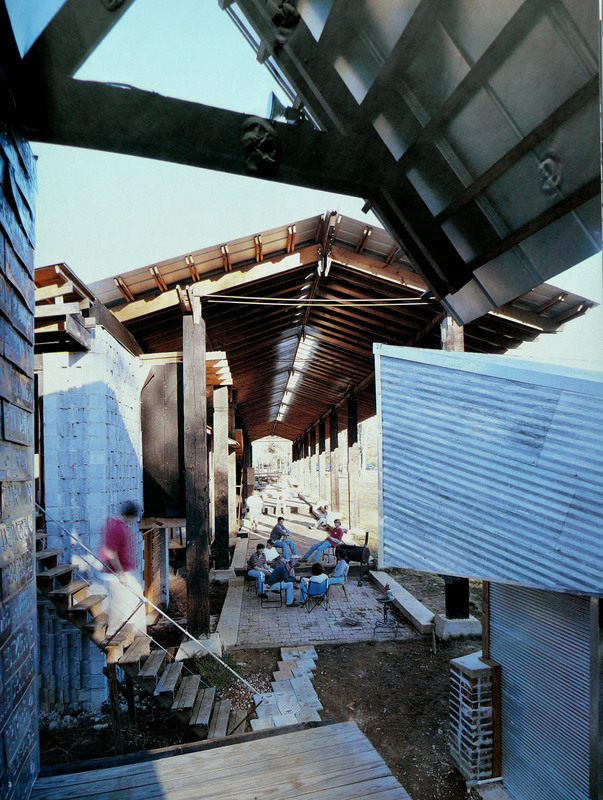 Mill Creek Housing photo from from’ In the Realm of Architecture’. All other individual photos from my 1976 visit.